Ayurvedic Yoga Massage (AYM) was created by Master Kusum Modak, a very singular Indian woman who overcame the cultural challenges of her generation through the force of her work. Kusum was the very first to weave together Ayurvedic massage and yoga practice . She had just graduated in Arts when she first met Mr. Limaye, a wise and renowned massage therapist in Pune City. Limaye, seeing a lot of potential in Kusum, followed his intuition and spontaneously invited her to become his massage assistant. Meanwhile, Kusum’s health was in poor condition and she decided to embrace yoga to restore her health at the Ramamani Iyengar Yoga Institute, under the guidance of the venerated Guruji B.K.S. Iyengar. This practice lasted for more than two decades, during which she developed a unique knowledge through her own body of the ways yoga stretches could be integrated into the massages. Her unique movements and stretches differentiate her technique from all other Indian traditions, and her teachings have now spread around the world, especially in Brazil. I owe all of my gratitude, love and respect to Kusum. Ayurvedic Yoga Massage is a special bodywork therapy that combines ancient Indian massage with yoga inspired stretches. It is a deep and vigorous massage which uses the rhythms of one’s breath as a compass. This vast technique combines more than 400 movements that unlock sensations and energies, releasing tensions and eliminating toxins, acting as a powerful healer for posture alignment, fatigue, panic attack, distress or any kind of physical or emotional pain. Furthermore, it helps to return the body and mind to their natural equilibrium and state of well-being. The massage takes place on a special mat set in a room scented with handpicked aromatherapy oils. Over the course of a one-hour session, Purnima works in a meditative state to connect with the body and intuitively guide her massage. She uses vegetable oil combined with a natural and medicinal root powder, to warm up the muscles and exfoliate the skin. During the massage, she uses the rhythm of her breath combined with the client’s to perform stretches using her hands, forearms, elbows and feet. This technique brings a beautiful awareness and flow within the body, and a wholly cleansing peace and vitality. Harmful stress is not always easy to pinpoint. It manifests itself in our breath, our sleep, our eating habits, our communication and most importantly, our presence. It often originates from a loss of control over accelerating areas in our lives. Taking actions such as short vacations, visits to the gym or good a night sleep might not be enough to resolve accumulated tensions when one has reached a state of unmanageable stress, or distress, that requires a deeper intervention. Ayurvedic massage is an exceptional tool for stress management that surpasses many other types of therapies by virtue of its holistic approach. It addresses all levels of distress (physical, emotional and mental) through the use of deep breathing and stretching. And the powerful connections that it creates within the body revive the patient’s sense of feeling. Accumulation of tensions in the physical body can block the free flow of vital energies and induce distress in the endocrine system, causing the glands to secrete unbalanced levels of hormones. By initiating deep relaxation, the Ayurvedic massage has delivered excellent results in readjusting neurotransmitters and restoring the flow of energies and hormone levels. It also activates the parasympathetic nervous system, responsible for the body’s ability to recuperate from stress. These benefits will reflect in your mood, confidence, well being, concentration, body awareness and vitality and be felt not only during the treatment, but for days afterwards. Most importantly, the massage will bring a lasting sense of security and integrity, which is essential to stress management. Soothe, relax and bring centeredness. 1. How does Ayurvedic Yoga Massage differ from other massage techniques? A: There are 3 main differences between AYM and other forms of massages. First, it is a therapeutic massage with an holistic approach, which addresses all physical, emotional and mental levels. Secondly, the therapist perfoms the massage on a mat whilst using not only her hands but also feet, elbows and forearms. 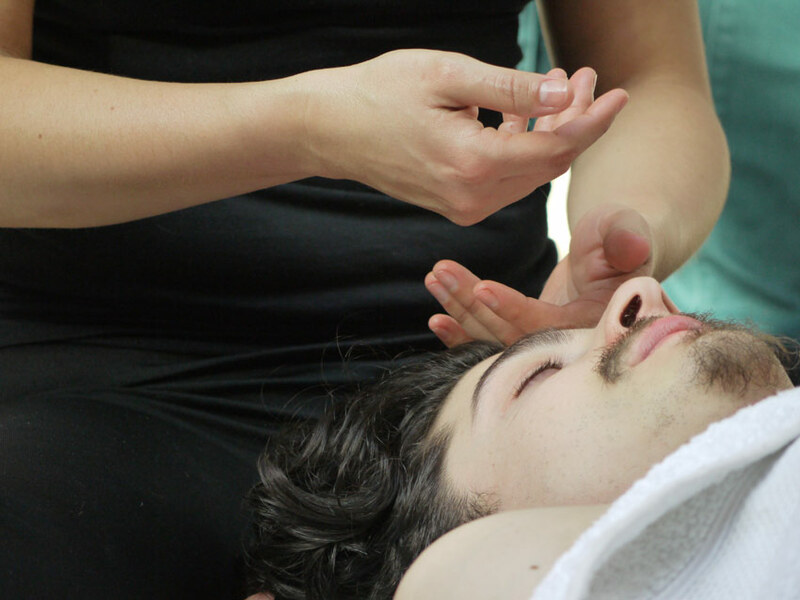 And finally, the client should breathe consciously and actively during the massage, as the breathwork helps to relax and extend the yoga stretches. 2. Why should I breathe deeply during the session? A: The massage demands your presence in order to feel the work and changes taking place within your body. Your conscious breaths help you stay in the present moment and relax during the stretches whilst your pulsation guides the therapist’s movements. It is best to approach the massage as a collaborative effort where your breath helps the therapist perform his technique. Therefore, there is no value in being completely passive in receiving the massage and stopping the conscious breathing means resisting the therapist’s work. Breath is life, and should always be taken in consideration, especially during deep treatments such as these! A: I use pure carrier organic oil, often blended with 100% pure essentials oils. A combination of the oil and natural root power is used on the entire body, which gives it a nice scrub. The massage does not leave the skin oily and a shower is not necessary after the treatment. 4. What is the use of the powder during the massage? A: The original name of the powder is vaikhand, often called calamus in English. It is a natural antiseptic root from the same family as ginger. I use it to warm up the muscles for the massage stretches. It is also great for stimulating the blood circulation and draining toxins out of the body. A: Shorts or underwear are best advised since the massage is performed directly onto the skin. Towels are used to cover the body and moved around so that the areas currently massaged are the only exposed. 6. How many sessions are recommended? A: uring the first session, I will be learning about the particularities of your body and your body’s reaction to the treatment. You should already notice a difference in your everyday posture. As you progress with the sessions, the stretches will go deeper and you will feel great physical and emotional benefits. You should always trust and listen to your body’s responses. In some cases, I recommend to patients to schedule a few sessions in succession at the beginning of a treatment. 7. Is it relaxing? Is it painful? A: During the session, but especially at the end, you will feel a very intense relaxation that will last for days afterwards. If we are able to work together with the breathing and your sense of feeling, and you are able to unleash your resistances, you should be able to feel a sensation of ‘switching off’ at the end of the treatment, similar to the feeling of getting a perfect night of deep restorative sleep. The massage does not create any pain in the body, but working on tensions that have been accumulating for a long time might make you experience some temporary discomfort. This is a step-by-step process and you should soon feel its great benefits. A: If you have any sort of infection, fever or cancer, it is not advisable to receive the massage. You should also get the approval of your doctor to receive a treatment after surgery or childbirth. Any other health circumstance can be handled by giving special consideration to each patient’s situation and adjusting the massage accordingly. 9. Can pregnant women receive an AYM treatment? A: Absolutely! Provided that your health is well and that you have completed at least 3 months of pregnancy. Also, once the baby is born, the massage is really effective in releasing fatigue, shoulder pain from carrying and feeding the baby and regaining quality sleep. In the emotional realm, the massage can help recover from postpartum depression and ’empty feelings’. 10. Is AYM suitable for babies and children? A: I recommend a specific massage for babies and children called Shantala. I have prepared a special section on this website for this purpose.